Mobile users always want the solution to ease up their communication. Rates set by telecom companies are usually high which make it difficult for customers to get most out of the communication channels. So, to save the cost and get maximum resources, customers usually opt for different bundles and offers. The bundles allow subscribers to enjoy all fun for the limited period of time. Usually, bundles come with the daily, weekly and monthly limit. You can choose the best for you according to your need and requirements. When it comes to effective bundles, Jazz is the network that first comes to mind. It always offers something unique and incredible to its customers. Like every time, jazz has once again provided an effective all in 1 bundle. Jazz super duper offer is a monthly package that gives you relief from the stress of limited resources and high rates. The offer allows you to make unlimited calls, send free SMS and access the web with data Mbs. You will get all the incentives at reasonable rates. To get more detail about the super duper offer, take a look below. Who don’t want to get maximum benefits at reasonable rates?? Surely everyone! Jazz super duper monthly offer can fulfill your desire for effective communication on inexpensive charges. You will get unlimited on-net and off-net minutes, free SMS and mobile data at just Rs.380 including tax. You can easily subscribe to Jazz super duper offer by just dialing the code *706# from your prepaid connection. You will receive a verification message which confirms your subscription. To check the status of the super monthly offer just dial *706*2#. The super duper monthly offer allows its subscribers to use all mobile services at affordable rates. You will get unlimited incentives which are listed below. 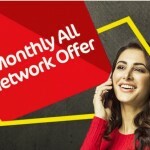 1200 on-net minutes will be available to call on nay Jazz and Warid numbers. Stay in touch with your off-net friends as Jazz will give you 100 minutes for other networks. 1200 SMS to all local networks for your one-to-one conversation through messages. Stay on your social media handles with 1000 Mbs for all 2G, 3G, and 4G users. Only prepaid subscribers of Jazz can avail the super duper monthly offer. The super monthly offer will remain effective for 30 days of a month. The offer will expire at the midnight of the 30th day starting from the subscription day. No call setup charges will be applied to prepaid calls. You should have to keep the credit of Rs 0.15 on your mobile to make calls with the super monthly offer. No time exemption or limitation will be applied; you can use the allocated resources for 24 hours. The offer is non-recursive; you have to dial the subscription code to reactivate the super duper monthly package. Operational fees, service charges, and FED taxes will apply on all services depending on your region. You will be charged at base rates if you are not subscribed to any bundle or offer. 5% withholding tax will be applicable to recharge and bill. The company has the right to change or withdraw the incentives or resources of offer anytime. Super duper monthly offer give you all services in one bundle. Prepaid customers should activate the offer to get unlimited minutes, SMS and data Mbs at lowest rates.